Picking up where the 2009 movie left off, this movie finds Flint Lockwood (voiced by Bill Hader) invited to join the Live Corp Company and use his gift for invention for the good of mankind. Just as young Flint prepares to go to work for his hero Chester V (Will Forte), the young genius learns that his water-to-food machine is not only still functional, but it's also started cross-breeding animals with food. In order to prevent a growing army of "foodimals" from escaping isolation on an island and wreaking havoc on the mainland, Flint and his friends will have to do battle with such delicious, but deadly, hybrids as the ferocious tacodiles, slithering apple pie-thons, and vine-swinging shrimpanzees. 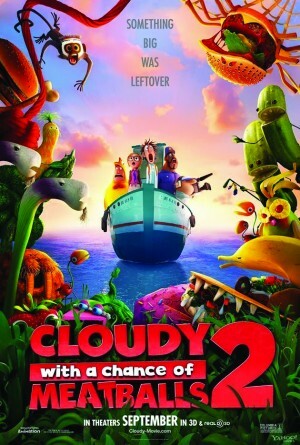 Cody Cameron and Kris Pearn direct this cute movie also featuring the voices of Anna Faris, James Caan, Kristen Schaal, Terry Crews, Andy Samberg, Neil Patrick Harris, and Benjamin Bratt.